What to eat and what not to eat had been my existential question for a long time. From the moment I remember, I cared for all stray, sick, and orphaned animals and my room was always filled with all kind of creatures to the desperation of my parents. Understandably, I always struggled with an ethical side of eating meat. In my 20's I had become a vegan, but later got back to dairy and poultry. When I was eating animal products, my deeply buried guilt never let me fully enjoy my cheese and roasts. When I wasn't eating animal products, I was fooling myself that I didn't crave them. I did. My attempt to raise my daughter without milk or meat failed. She developed severe digestion problems, so I had to bend over backwards to find raw milk and to learn to make cottage cheese and kefir for her. Besides, while all my arguments against meat were very convincing to her when she was a little kid, as soon as she grew into her teens, she didn't give a damn any more and, believe me, she compensated for all these burgers she was deprived of by me. For years my existential question hadn't been resolved. In fact, it became even more complicated as I had learned the truth about modern industrial, mono crop, chemical agricultural practices. It forced me to think not only how ethical my food was, but how it affected my health and the health of my loved ones. Besides, another side of the problem became more and more evident to me - how disastrously modern industrial agricultural practices, even organic, were affecting our environment. In search for the solution we decided to move to the land and to start from the very beginning - from growing our food ourselves.​ We wanted to find out how to eat healthy and to farm differently. We realize that if we want to put a piece of meat or glass of milk on a table, there is no any other way but to take a life of an animal. This we cannot change. What we can change is how this animal lived. And this is where a HUGE difference can be made. Our deep belief is that it is our responsibility to give all animals in our care the most natural and stress free life we can provide for them. We never confine cows. In summer time they have green pastures to graze and to roam. During winter, they still have free access to a field to run and to play (yes, they love to run and to play!) and to take sun baths. Our cows eat the food nature intended for them - grass in the summer and hay in the winter. 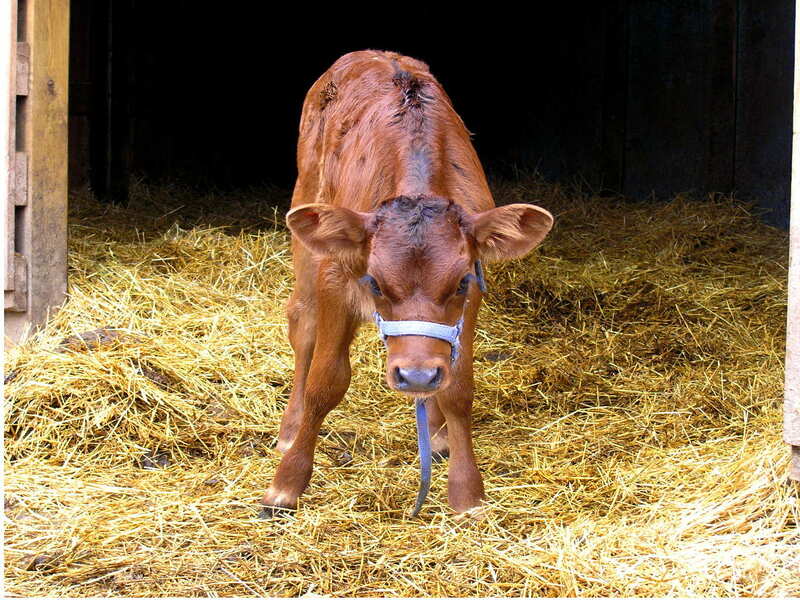 We supplement them with small amount of grain mix or roots during milking and we don't think it would harm them (or anyone) to have their little treat once in a while. We never take a calf away from his mother. Our cows produce milk firstly for their babies. For us, we are milking the excess. It is not as economically sound as conventional dairy practices, but our method has one huge benefit we are willing to make the compromise for- guilt free, ethical, the most healthy milk. We never cage our birds. We believe that the best thing we can do for them is to give them full freedom. Freedom to roam around the property, freedom to search for bugs and warms all day long, freedom to eat as much grass as they want - freedom to be birds. Sometimes this freedom costs them their lives when predators visit to hunt. But this is the part of their chicken's life too. Yes, the production suffers quite a bit, but the eggs we are getting are ethical and the most healthy and delicious eggs. We let our meat birds mate and reproduce naturally. We let them make their nests, hatch their eggs and raise their poults. 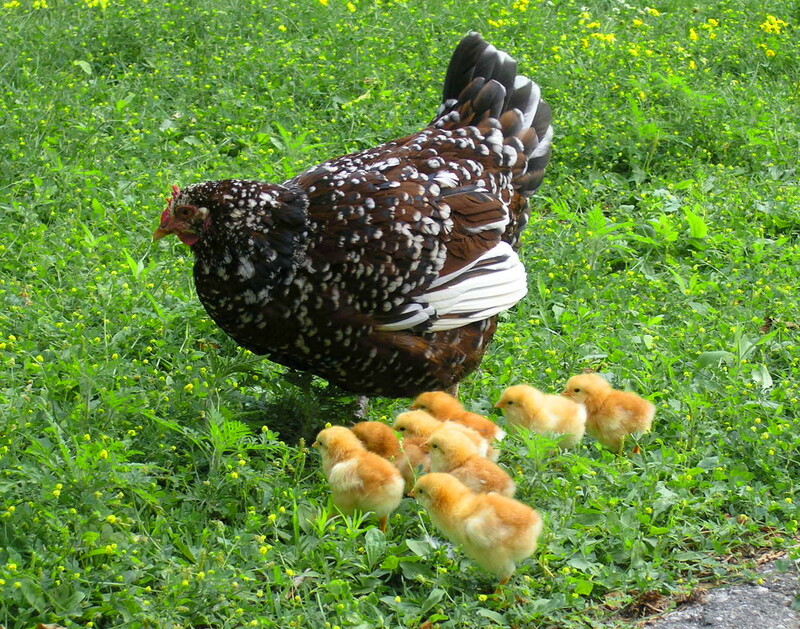 Raised by their mothers on a pasture, poults, chicks and ducklings are exposed to fresh grass, bugs and sun from day one. We are keeping heritage breeds. Modern heavy broiler type of birds are unable to mate naturally because of their enormous weight. Actually, most of them would not survive till maturity because of various health issues they develop. Of course, it takes our heritage birds 3 times longer to grow, but it is OK, let them have their time. We think this is how ethical poultry should be raised. One day our neighbour, an old dairy farmer, came to visit us out of curiosity. Our first bull calf was born just recently. "Do you know how to raise the most tender, juicy veal ever?" the farmer asked me looking at the little boy laying beside his mother, "Just take a bull calf away from the cow, put him in a tight dark crate so he can not move much, feed him a bit of milk for the first four weeks and as much corn as he can eat all the time. In 16 weeks you will have a mouth watering veal." Well, we decided that never will we try the most mouth watering veal. Or any other veal. And, you know what, we will survive. And also we will survive without few-days-old piglets, foie gras, capons, you name it. Family milking cow is synonymous to a homestead life. 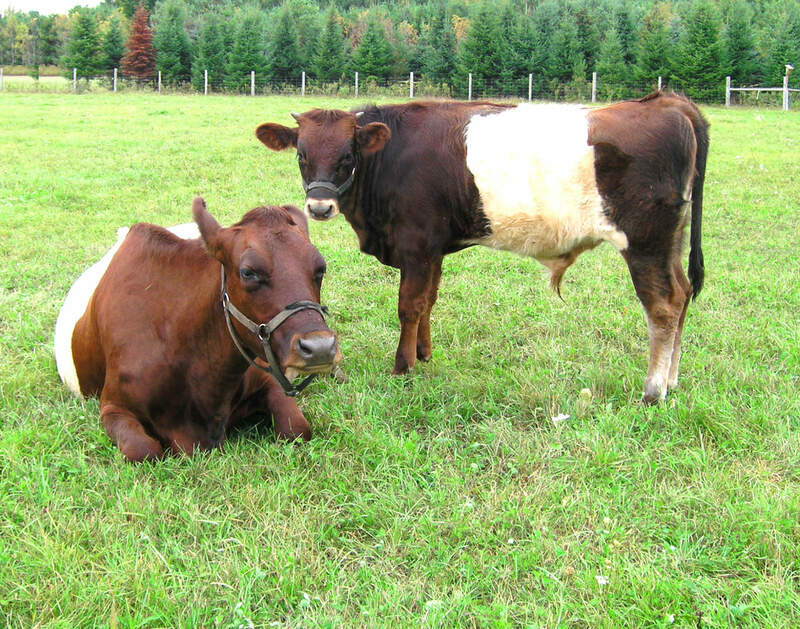 Our first one was Dutch Belted Martha, brought from the Nova Scotia dairy farm where she was #822. Later we added couple of Canadienne cows as we find them better fitting our set up. Our cows are raising their calves on plenty of milk, so, once in a while we have dairy beef for sale, grown on unlimited mother's milk and grass and never separated from the herd. Our cows provide our homestead with delicious milk, our pigs, birds and dogs with buttermilk and whey, out vegetable garden with rich compost. And, by mowing and fertilizing the fields, they play an essential role in the restoration of our poor, exhausted soil and bringing back native plants, pollinators and wildlife diversity. We are keeping heritage breeds of poultry - little funny Khaki Campbell ducks, Roman Gees, Beltsville and Standard Bronze Turkeys, Speckled Sussex chickens. Because of their excellent forage ability, they are able to take full advantage of the most sustainable source of protein - bugs, warms, snail and slugs, which healthy soil produces in abundance. In addition to insects, they are consuming A LOT of grass. 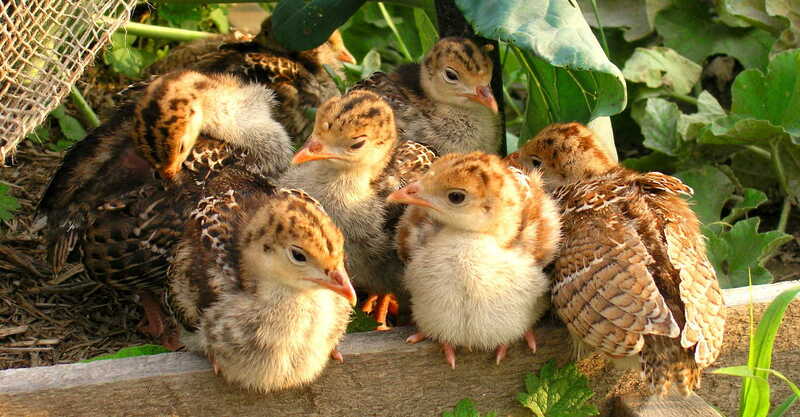 When I was watching one day old naturally hatched turkey poults, I've noticed that their first instinctive attempt was to catch a fly and to pick a weed leaf, not a crumb of a turkey starter. So, we've decided to leave them alone and let them have their freedom and their natural diet. We are raising heritage Tamworth and Berkshire pigs and appreciate their hardiness, mothering qualities and ability to build up precious lard on buttermilk, whey, roots and garden greens. We raise our pigs outdoors and completely soy free. Not corn free though as they are enjoying organic sweet corn from our vegetable garden in season. 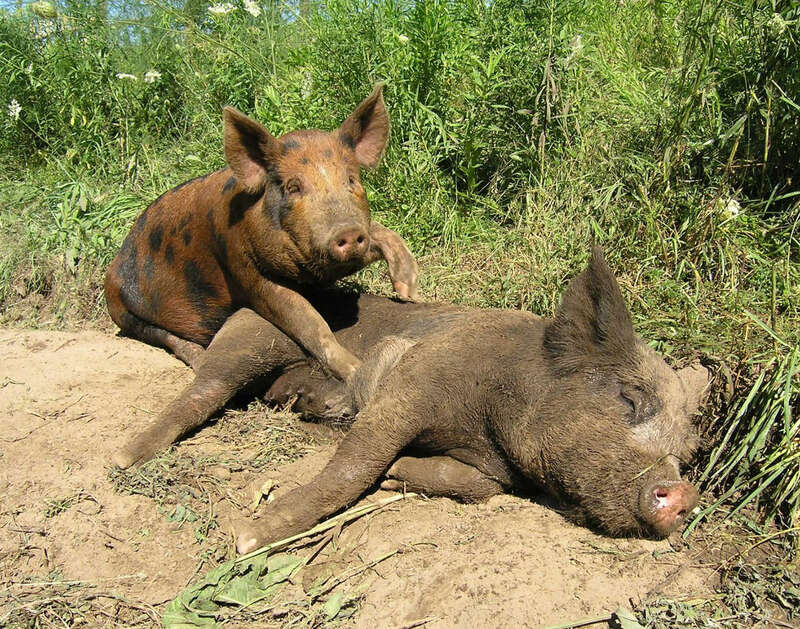 In a small farm environment pigs always were and may be again, the most sustainable meat if to raise them on the waste from vegetable gardens, wine making and cheese making operations or if to switch their ration away from soy and corn to their natural diet of roots and acorns. Cows and sheep graze differently. Cows prefer grass whereas sheep prefer weeds. 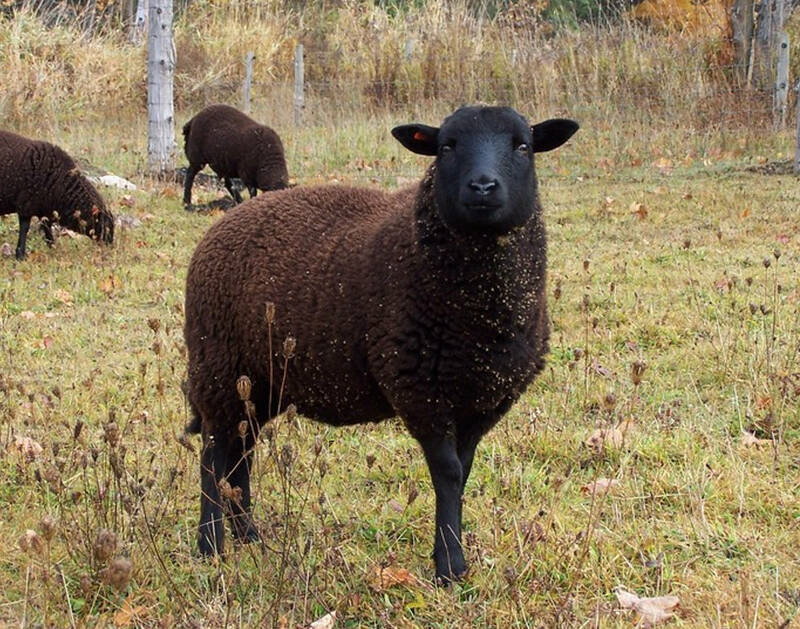 To complement our cows grazing to build up a better and healthier pasture we are keeping a small flock of amazing Black Welsh Mountain Sheep. This small, undemanding primitive breed originated in Welsh, Great Britain. For centuries heritage sheep were providing humans with healthy meat and warm fibre, helping us to survive even in the harshest climates and on the most difficult terrains. Their hardiness and ability to thrive on poor vegetation made them a symbol of resiliency and adaptability. We fell in love with these amazing animals and are committed to preservation of the breed and it's valuable traits. 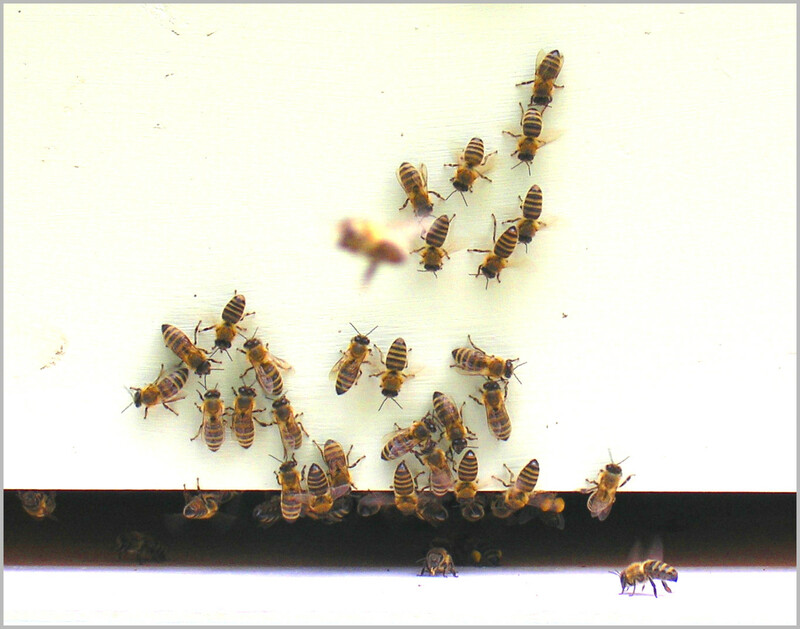 We cannot imagine our life without bees buzzing around. This calming, peaceful, grounding sound means that life is still going on the planet Earth. But if only couple decades ago we took it for granted, these days it is a great relief to hear it again each spring. The bees and native pollinators are in danger. Spreading of mysterious diseases and parasites combined with weakening immune system caused by modern chemical mono agriculture are killing them. We are trying to help our bees to strengthen their immune system and their ability to resist pests and diseases by keeping them treatment, sugar and stress free. Diversifying the forage with greater variety of native weeds and shrubs is essential too, and not only for saving bees, but also for saving rapidly disappearing bumble bees and other native pollinators. No homestead can exist without a dog. A good dog is a necessity of life on the land as our safety and the safety of our livestock rely upon her. When we moved to our farm, we moved to a territory occupied by numerous wildlife. Coyotes, wolves, foxes, deer, racoons, weasels and even a mama bear with her two cubs felt quite comfortable here. We did not mind them at all until we started our vegetable garden and got our first chickens. That year the local wild life had a real feast. We were left with a couple of corn ears that grew too high to bother and a couple of frightened chickens whom we had locked in a chicken coop in time. 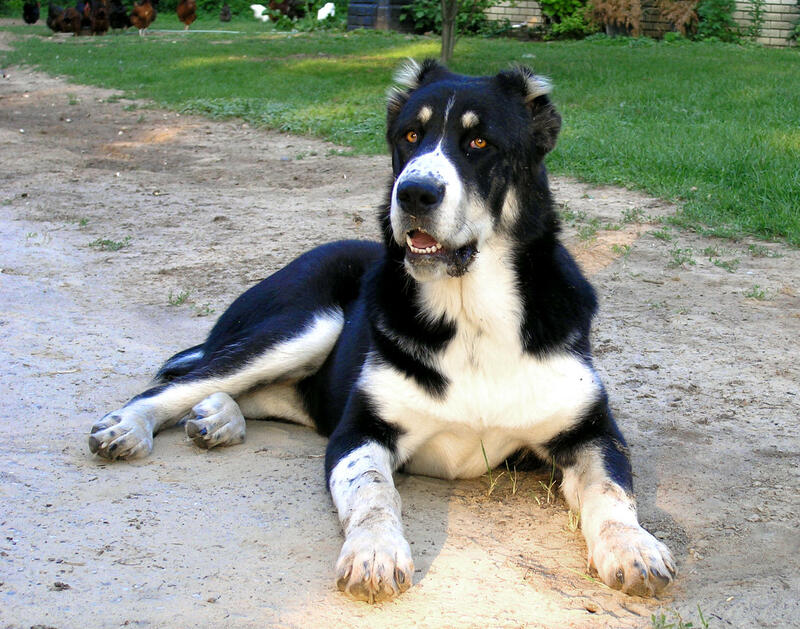 Now we've got our precious Central Asian Shepherd Marusia, and our losses are close to none. Don't ask us how this gentlest and friendliest giant does it. We simply don't know.